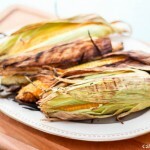 Grilling corn on the cob in its husk makes it smoky and sweet. Add this corn on the cob to almost any outdoor meal! If you have a charcoal grill, start your coals now. Pull the husk of each head of corn back to the base, but do not allow the husk to disconnect. Remove as much of the silk as possible, and then wrap the husk back up around the cob as tightly as possible. Fill a large bowl with cold water, and soak the cobs for at least ten minutes. If you're using a gas grill, preheat the grill now. Place the corn on the grilling surface, trying to keep the husk between the grilling surface and the kernels whenever possible. Close the lid and grill for five minutes. Open the lid and turn the corn, again using the husk as a barrier for the kernels when possible. Close the lid and grill for an additional five minutes. Open the lid and turn a final time. Grill with the lid close for an additional five minutes, or until the kernels are easily popped with a grilling fork. Serve immediately and carefully, as both the husk and the corn itself will be very hot. Serve with butter, salt, and freshly ground black pepper.